Creating a wood project requires certain tools to perfectly cut, drill, carve, or shape the wood. So that you can efficiently produce a well-made wood product, your tools must be sharped and maintained at all times. There are eleven basic woodturning tools used in wood working: roughing gouge, spindle gouge, bowl gouge, skew chisel, parting tool, hallowing tool, scraper, bowl saver, auger, chatter tool, and wire. When people think of woodturning tools, they tend to thing of the cutting end first and ignore the handle, unless they are making their own. Yet when turning, it is the handle we grip and the more comfortable and usable it is the better, especially when employed for long periods of time. There are a few simple things to look for when selecting or making a tool handle. To begin with, both chisels and gouges are edge tools used for shaping wood. Both tools consist of a shaped, metal blade that is attached to a wooden handle, usually by one of two methods. Some use a metal tang which is inserted into a hole drilled into the handle. The tang, the portion inserted into the handle, is just the back end of the blade, which has been worked almost to a point. The tapered tang can be firmly wedged into a regular hole so the blade won’t fall out. 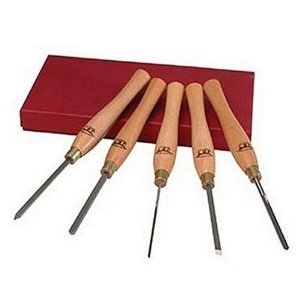 Chisels and gouges fastened to the handle with a tang are more delicate tools and include paring chisels and carving gouges. One of the things that would be woodturners first realize is the lathe they buy comes without tools. Woodturning lathes are sold with a means to hold wood to the wood lathe and then to revolve the wood. Unlike a table saw or band saw that come with would be sold habitually with at least one blade, no cutting tools are supplied. Thankfully there are quick options to find ones way through the myriad of offerings in the woodworking catalogs. Woodturning Tools Is better really better? My Jet lathe included a free set of turning tools, a promotion at the time, but the advice regarding quality chisels stuck. I have long believed that high-quality tools usually have qualities that make them more effective, often easier to use, and that justify the larger initial cost. I added a Crown five-piece beginners set of HSS (High Speed Steel) turning tools to the pile when buying the lathe. The set included a 3/8" spindle gouge, ¾" roughing gouge, ½" skew chisel, ½" round nose scraper, and a ¼" parting tool. This selection has proven to be very capable for nearly all of my turning projects with the understandable exception of hollowing and internal bowl tasks. The actual size of the tool isn't real important for starting out. You'll develop preferences for some over others as you go. The main criteria is that the tools are HSS (high speed steel). Anything else will be frustrating and short lived. Just about anyone's brand is fine as long as it is HSS. Woodcraft has their own label tools that are usually cheaper than the comparable Sorby that they sell. The difference is in the handle, and sometimes in the length of steel in the tool itself. They are excellent tools for a better price. First select the wood of the proper size. For small size tools green wood will work but for larger tools I would use dry wood. Since wood takes about a year per inch to dry cut or split some now for future tool handles. I've turned larger green handles and just let them split. After a few months just fill this void with epoxy and sand it down. You can also laminate wood to get the thickness. Brenda chose a solid piece of dry wood for the demo. There was some discussion on whether to drill the hole for the tool before or after turning. Brenda drills a small hole and uses a 60 degree live center in the tail stock for centering. After the handle is turned a drill is mounted in headstock with a Jacobs chuck and the handle is pushed onto the drill. This gives the proper size hole for the tool.